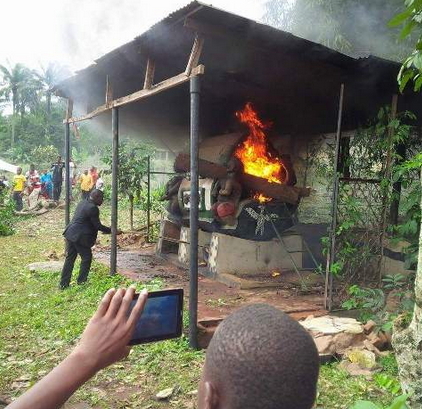 A zealous evangelist has destroyed the shrine of Ikoro in Uga town, Anambra. According to NaijaGists.com, the man of God was invited to conduct a liberation service in the town. After spiritual cleaning, he moved from shrine to shrine to eliminate traces of evil in the town. Ikoro aka Slit drum is a traditional medium of communication in Igboland. The beating of the Ikoro signifies many things to the Igbo people every sound is peculiar to the beat. It may signify a call for war, an emergency, a call to duty or to announce the death of a prominent member of the community among others. At the sound of the Ikoro, all members of the community are expected to respond immediately by coming out to the village square where the specific reason for the beating is relayed to the people. It is considered a cultural abnormal for the Ikoro to be sounded without due cause. This means its expression is bound by mores that gives it a cultural uniqueness which makes the Ikoro not only a means of communication but also an instrument of expressing cultural unity and a sense of purpose among the Igbo people of Nigeria. Our source said the Ikoro shrine at Uga has been sounding without due cause in the past 3 months and has brought unrest to the community. Ikoro Shrine keepers need to provide blood of virgins and human skulls yearly to appease the gods behind it. This is why they called the man of God to help them get rid of it. Ikoro worshippers are still waiting to hear the death of the evangelist as they believe whoever committed such sacrilege will die within 24 hours. In Pictures: Abuja Showbiz Prophet Joshua Iginla Gives Hummer Jeep, Toyota Prado SUV & 30 Cars.. This is very funny. The evangelist will not die in Jesus name. During Easter I did it to our our as well. Removed all statures in form of decoration placed by my dad. The evangelist did a good thing. these shrine hold back progress. How can they offer virgin blood. may God forgive those who built the shrines. ANOINTING Breaks the Yoke. JESUS CHRIST is LORD Forever. Is this religious freedoms we preach in Nigeria ? For Gods sake this is another mans religion.power of God is not physical. this shine can be rendered powerless without burning it down.we learnt to carry out actions within the law. Thank God this bloods need Tradition must be wipped out in this naija and all over the world,we are 2015 God. Good news, the bible said “my people perish for lack of knowledge” thank God that the villagers realized the need to destroy the evil shrine so that their village can be liberated. for the evangelist, God that called you will never disappoint you. stupid **** people. This is why you have no history or culture. You destroy your tradition in the name of religion. The ***** people who first brought Christianity into Nigeria still separate religion from their culture even when it involves burying a living man along with their dead oba. Is so obvious that some parts of our culture are cruel and primitive, that some of us still engage in such act like virgin sacrifce ,devotion to heathen gods and secret practices..just to please a god. This should be an eye opener to us , to always be covered with the blood of our God. This is the something that we’ll be showing our future children of what forefathers depends on,inorder to hear from God. Our acient artiphats established great grand fathers, that’ll serve as tourist centres in future to come in our land is being destroyed by over zealous ignorant people. That’s what Chinua Achebe saw far back and wrote “Things fall Apart” and indeed things has falling apart. The idiots who laud this act of destruction remain brainless in their religious fanaticism and are no better than ISIS. How could anybody praise this stupid and criminal pastor for destroying what is a precious national artifact? It’s only in Africa that we destroy what is ours in the name of the madness of religion. The Catholic priests did not touch it because they knew it was not really a problem. But look at these hungry people with so much God on their lips and evil in their hearts. In other lands, shrines like this attract earnings which help to develop the land. Here they are set on fire in the name of God.